Iracema Camargo Garcia has faced challenges that most of us can’t fathom. “I suffered a lot in my country,” she remembers. But Iracema is a fighter. No matter what challenges faced her, she persevered. Iracema emigrated from Mexico when she was 20 years old. Still, she didn’t give up. After working as a janitor, she founded a maintenance business. Iracema wanted to improve her English, so that her business could be even more successful. Luckily, she heard about Contra Costa College. While at CCC, Iracema started to dream bigger. What if she took business courses at CCC to boost her business expertise, then transferred to UC Berkeley’s Haas School of Business, which she heard was a premier institution? Wouldn’t that help her run a better and more efficient business? 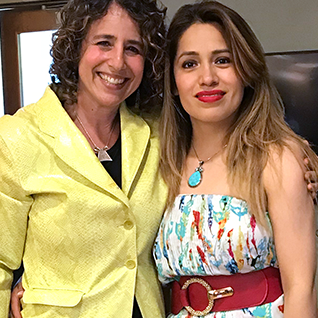 At CCC’s Counseling Center, Iracema found the support she needed to see those dreams through. Iracema worked hard. She raised her children (now eight and ten). She ran her business, often studying at the same time. And, she never gave up. Her determination paid off. She was accepted to both Haas and the University of California, Los Angeles. Iracema also received the EOPS Transfer Scholarship, the Associated Student Union Achievement Scholarship, the Stephen Schaefer Scholarship and the prestigious Kennedy King Scholarship. She credits those with helping her continue on. Iracema has chosen to transfer to Haas, because she wants to stay close to her chosen home. She wants to use her own success to give back to the community, by helping those in need and encouraging people to pursue higher education.